If you restrict your selection of equipment to the essential, and then pack it correctly in your rucksack, it will be considerably easier to carry. In this regard it is important that the various items are packed in the correct sequence. That means, for instance, that light items, such as the sleeping bag and spare clothing, are stowed in the bottom part of the rucksack. Heavy articles, like cooking equipment, food or the tent, on the other hand, should be placed in the upper part of the rucksack, as close as possible to the back. Once the rucksack is loaded, the compression straps are pulled to fix the load within the rucksack. In a next step, all of the straps belonging to the carrying system (shoulder strap, load control strap, hip belt, and hip belt stabilisation strap) are released (ill. 1). The rucksack is put onto the shoulders. The tightly pulled hip belt should sit approximately in the middle of the side hip bone and enclose this snugly. The height of the shoulder strap can be adjusted as necessary. The starting-point for the load control straps should lie on the collar bone (ill. 2). The shoulder strap can now be pulled on (not too strongly) (ill. 4). The chest strap is closed and thereby prevents the shoulder strap from sliding off the shoulders or forming pressure points (ill. 5). The load stabilisation straps are pulled on, without the shoulder strap being lifted from the shoulder carrier. The starting-point for the shoulder strap should lie approximately a hand width below the seventh vertebra of the neck (the one that is most prominent on the neck). If areas of pressure arise, the aluminium struts or the back plates can be adjusted to fit the shape of the back (preferably by a specialist dealer). Light articles are placed in the bottom compartment - such as the sleeping bag or possibly spare clothing. Pack kitchen equipment, food, spare clothing, personal objects into the main compartment. Heavy articles should be placed at the top and close to the back. Pack the equipment that is needed least frequently (bivouac bag etc.) as far towards the bottom as possible. The first-aid kit and weather protection should be within easy reach in the top part of the rucksack. Large, bulky items (camping mat, tent) are affixed to the outside of the rucksack with compression/packing straps. All of the items that are needed more frequently are packed in the top and exterior pockets: toilet paper, extra clothing, drinking bottle, maps, compass, snacks etc. When not in current use, long objects - such as tent poles or trekking sticks - are affixed to the side of the rucksack’s compression belts; the ends are placed in the tuck-in pockets. Articles that are not used very often, such as money, keys and papers, are placed in the document pocket on the inside of the top compartment. 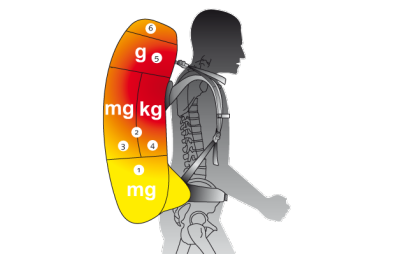 The rucksack’s point of balance should be as close to the body as possible at shoulder height. The rucksack shouldn’t be heavier than ¼ of one’s own body weight.